← Are you living behind a mask? The dreaded question – ‘So What Do You Do’? Last week, out of the blue, I received a phone call inviting me to be the ‘prize’ in a radio (Wave 105FM) competition, in which the winner is given an expert for a week. Donna, the prizewinner, an amazingly peaceful and courageous lady, wanted to work with a coach. As this is part of a wider promotion by the sponsors of the competition, Direct Line, a series of short films about the week are being made at the same time and will appear on Facebook next week. help people look at their lives from a different perspective, so that they can gain clarity. This may be a times when they are feeling stuck, or are at a junction point in their lives or need inspiration or fresh insight to help them move forward. Having sorted that out in my head, I felt very calm and, well, clear! This was a bit of a light bulb moment for me. I have been trying to work out a statement like this for some years. Over that time I have come up with several variations and ‘elevator’ speeches, and have spent quite intense periods of time agonizing over how I express what I do, trying to fit myself into an already existing label, such as life coach, business coach, executive coach, or leadership coach. This is because one of the things I feared most as a child was not being understood. What I learned when little was that if people did not understand me I might as well not exist – I am not worth knowing. And that did not feel great, to put it mildly. One way of avoiding those feelings was to try and fit myself into an already recognized box – tinker, tailor, soldier, sailor, doctor, lawyer etc., because then people would understand what I do, or at least have some idea, and validate me. As I grew older and attended parties or networking events where inevitably that question ‘so what do you do?’ would appear in conversation, I felt tongue tied, because if I said ‘I am a……’(whatever title I had at the time), part of me felt like saying ‘but I am far more than what you think a ….. is!’ – I never found a box into which I fitted comfortably. 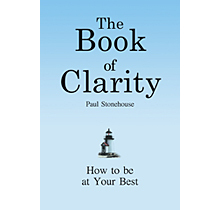 Back at the radio station, when asked, I confirmed that I would like to be introduced as Paul Stonehouse, the Clarity Coach. The presenter was very struck with the name and the film crew very quickly got that I am about bringing clarity to a situation. They understood! Adding to this, I did not say in the description of what I do that I am ‘a’ anything – ‘a’ plumber, ‘a’ doctor, ‘a’ leadership coach. I put it in terms of what I do for people, and in that way they very quickly see what is possible for themselves. I was talking with a friend yesterday, and could see that something was incomplete for him, as things weren’t working out in line with his expectations. He too has struggled to fit into a box of other people’s job descriptions. I fed back to him that I could see that he is outstanding at creating a space where people could connect with each other and be self-expressed. His response was initially ’so what, surely everyone can do that?’, but on reflecting over his career, he could see that that was exactly what he had done in all his roles, and had in fact turned down a senior job because he felt that it was not about empowering people. He isn’t one of ‘a’ anything – he is him – he has a very special talent, and when he looks at his work from that perspective, things look very different. So the moral of the story is if in doubt about answering the dreaded ‘what do you do?’ question, talk about what people get out of working with you. Don’t be shy – talk about your talent, not your title, because that is what people actually want to know. In particular, if you are providing a service to people, they want to understand who you are as a person – they want to ‘get’ you. Paul Stonehouse is an experienced coach, educator and speaker, and is completely committed to helping people perform at their best. His particular passion is helping people move forward when they are stuck, enabling them to live and work a in a way which is a confident expression of their true selves. 3 Responses to The dreaded question – ‘So What Do You Do’? Congratulations Paul! Excellent post..and has got me thinking about my ‘wording’. Maybe I’m a “Feel better at mid-llife” coach! Hi Sally, that sounds like an interesting strapline…! Something along those lines would resonate with lots of people. What do you do/ how do you help/ what do you bring to the party that enables the outcome of feeling better? Have fun with it – I know it’s something I have played with for years! Oh absolutely, Paul though it’s months rather than years in my case 🙂 I think I’m ok with telling people what I do (eg one v short version is i help people in mid-life with lots going on), but I just liked the idea of a snappy label – for some occasionsat least!